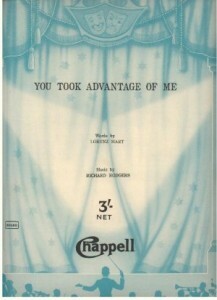 “You Took Advantage of Me” was written for the 1928 musical Present Arms. The song quickly found itself a popular standard, and has been recorded many times, including those by Bing Crosby with the Paul Whiteman Orchestra, Django Reinhardt and Stephane Grappelli, Anita O’Day, Ella Fitzgerald and Billie Holiday. I’m a sentimental sap, that’s all. What’s the use of trying not to fall? ‘Cause you took advantage of me! And you’re gonna shake me down somehow. My elbow from my ear. And much worse when you’re near. ‘Cause you took advantage of me. You Took Advantage of Me was recorded on April 4, 1961 and released in 1961 on the album My Heart Sings. It was arranged by Ralph Burns. “You Took Advantage Of Me” was recorded in July 1973 and was released in 1977 on Tony Bennett Sings More Great Rodgers & Hart.